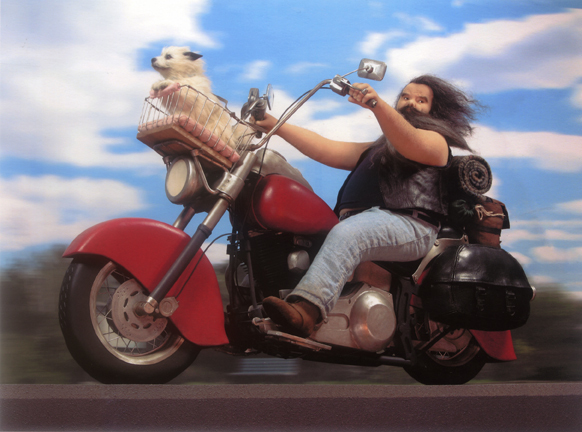 This tableaux to freedom and open-road camaraderie was inspired by a man and his dog riding a large motorcycle. I saw them in the next lane while traveling I-95 south into New York City. A few months later, my sister went to see the launch of the Space Shuttle and claimed to see the same duo in a truck stop in Florida. (What are the chances of us seeing the same guy?) As Allyson is often fearless on holiday, she introduced herself and got to pet the dog. It turned out they shared a love of NASA, and the biker said he and his dog, “Killer,” had seen all the shuttle launches. Accepting coincidence as a mandate, I started sketching out the piece. The bike being a bit of a mystery, I purchased a Harley Davidson model kit, and put one together. The box said “good for ages 7 to 14.” I now have a new respect for the intellectual and physical capacities of young boys. It even included parts of the engine that would never be seen when the model was finished. Harleys have an open-wheel design which would never hide a support wire, so I began studying the covered-wheel designs of Indian motorcycles. Fortunately, I live within a half-mile of the old Indian factory in Springfield, Mass. and my aunt took the orders there for many years. (she was proud to only get the color wrong once). I wanted to do my favorite – the 1948 Indian Chief, but no engine design specs could be found. Then I realized I could personalize the beast by putting Indian wheels on a Harley frame. Yes, my biker could have built a custom hog in his garage using parts from his father’s Indian. The bike ended up with a lot of character – strong, comfortable, as dependable as his dog, and as individual as an old sailor – a steed you could spend your life on without ever getting tired of it. “Trixie” is the dog I went to college with was my constant friend for 18 years – definitely a proper lady until the landlord stopped by, and then a “killer,” indeed! 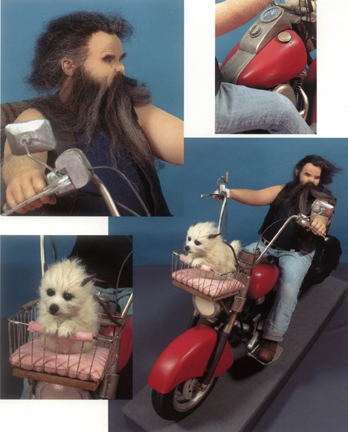 “Rocky” is an amalgam of several bikers I have known – one in particular had a magnificent beard. (I have wanted to do that beard for over 20 years.) I lost track of the guy who grew it, but I often wonder where that beard is today.